Are you unhappy with the bright vertical lines or dark horizontal area at the top and bottom of your fluorescent or LED tube lit scrolling display? Having difficulty changing posters or do you think tubes are the only illumination option for your scrolling display? Interested in reducing your energy bill by up to 90%? 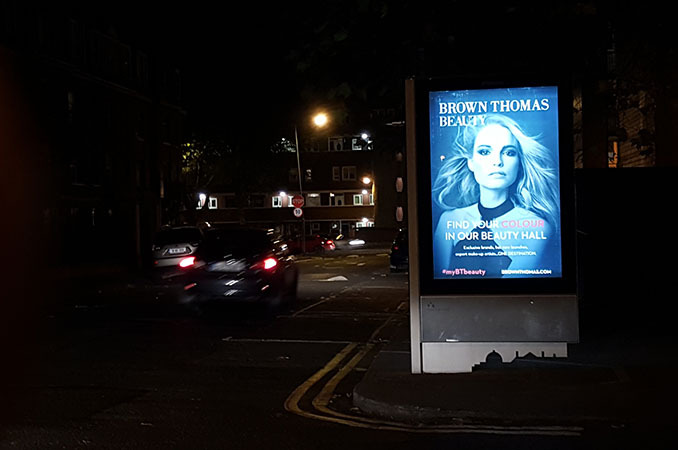 We design and supply turn-key LED lighting systems specially designed for small format OOH advertising displays to transform your assets using specialised optics, industry leading LED technology and bespoke installation hardware. Energy bill reduced by over 50%. Significantly reduced maintenance costs with 5-year warranty. Customised rigid reflector system to remove dark areas and bright lines. High brightness LEDs with true colour rendition provide bright, uniform and vibrant display illumination. Custom LED optics to remove glare to result in a truly uniform illumination. Up to 790 kgs of carbon saved annually per display compared a 3 fluorescent lamp display. An ever increasing range of adjustable mounting bracket systems that facilitates speedy installation. Suitable for on-site or factory installation.